Pioneers in the industry, we offer industrial sectional overhead doors, transparent sectional overhead doors, sectional overhead doors and garage sectional overhead doors from India. Avians Industrial Sectional Overhead Doors guarantee maximum security and reliability as they are made of steel panels. The double-skinned PUF core design is heat insulating and particularly suitable for heated halls. Our Doors are specifically designed to suit the modern industrial architecture. We offer a complete range of overhead sectional doors; either insulated sandwich panel doors or glazed doors. They can also be supplied as fully covered or semi-glazed versions for optimal daylight exposure. They provide good air tightness and insulation. High precision hinges made of galvanized steel, roller guide with adjustable ball bearing rollers are provided for smooth movement of the door. Intelligent safety edge mechanism stops the door if it comes into contact with an obstacle. We are one of the leading manufacturer and supplier of Transparent Sectional Overhead Doors and our product is made of good quality. Aluminium profile incorporating synthetic double glazing to form suitable transparent door panels. Threshold bottom ensures the door firmness & stability. Standard Safety edge mechanism stops the door if it comes into contact with an obstacle. We are one of the leading manufacturer and supplier of Sectional Overhead Doors and our product is made of good quality. 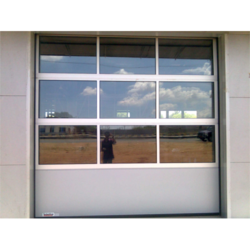 Steel door panel is with 40mm/80mm thick, Double-skinned, Poly Urethane Foam (PUF) core. Finger safe joint panels with EPDM seal to provide intermediate air & water tightness between panel joints. Biologically panels are immune to attack from fungi, mould & vermin. Sound Insulation can be achieved. High precision hinges made of galvanised steel, roller guide with adjustable ball bearing rollers are provided for smooth movement of the door. 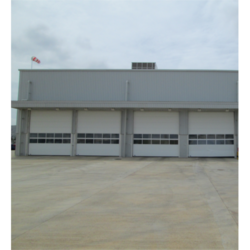 Industrial sectional doors are maintenance-friendly, resulting in minimal service costs. Avians Range of Automatic Garage Sectional Overhead Doors is one of the most popular and practical choices for style, safety, security, easy to use and versatile. Avians bring you the best design to suite the esthetics of your home. They are a modern day alternative to conventional doors that was used for garages. The fantastic insulation value and security properties of a double skinned, insulated sectional garage door also mean that it is an ideal door to maintain a constant temperature inside. With our garage sectional doors, you are able to use a complete length of the driveway and they give you more space both inside and outside of the garage. 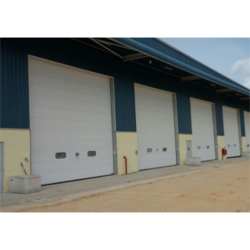 Looking for Sectional Overhead Doors ?